As Parents/Carers we hope that this brief overview will give you the information you need to provide a supportive role in future decisions of your son/daughter/charges. 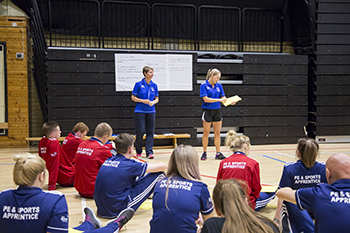 This is an overview of what to expect when embarking on a PE Apprenticeship with Sporting Futures Training. Working in partnership with our host/partner schools we hope to develop and empower the individual to equip them with the skill set and employability skills that will enable them to fulfil their role as a PE Apprentice within a School Setting. What qualifications are involved in Intermediate apprenticeships and advanced apprenticeships? Apprenticeships are work-based learning programs that allow for an individual to gain levels of competency relevant to the job role they are appointed for, in this case the role would be a PE Apprentice. The Apprenticeship program can lead to further study and entry level to Higher Education Establishments or it can lead to next steps on a career pathway of an individual’s choosing. It does not carry UCAS points BUT the invaluable opportunity to develop work based experience and the associated life skills that accompany such an alternative route. NVQ and QCF qualifications - are designed around the skills people use at work and cover all types and levels of work. Each qualification is made up of a number of units of competence which set out what an individual must be able to do in a given area and to what standard. Apprenticeships are changing to Standards and these will involve job roles meeting set criteria related to the Knowledge, Skills and Behaviours associated with the job role. A Regular week would involve a PE Apprentice being employed within a school and working four days within school and being released for one day to attend training and support the delivery of localised competitions as organised by the local PE and School Sport Network. As support staff PE Apprentices should not be on their own with a group unless there is an identified member of staff working in close vicinity. One aspect of their role is to enhance numbers at clubs NOT to take responsibility for clubs. Unless they are a more experienced NGB level 2 coach, in which case the delivery ratio is 16:1. By mid- spring term most of our support staff will be internally trained to allow for their competence to be assessed by their school/club to determine whether increased responsibility with lunchtime clubs etc can be given. Dependent upon which model, they will be placed within a host school for 5 days with time being set aside for training or they will be placed in a host school for 4 days with one day a week set aside for training and workforce capacity i.e. to support with delivery of competitions, link with School Games Organiser. Confidentiality would be adhered to by Apprentices and all aspects of safe guarding covered through their training plus additional school specific training as appropriate. Every Apprentice will be assigned a Tutor who will work with them to ensure progress is made towards the successful completion of their Apprenticeship.